To view the tentative schedule for Eight Winds 2011 click here. Hellenic ADF: It’s Greek to Me! With its Pan-Indo-European focus, ADF attracts members interested in cultures from across the IE spectrum. While the Celts and Norse still hold a strong majority within ADF, the ranks of Greek-focused members and Groves have been steadily growing. This workshop seeks to provide an overview of how we can blend ADF ritual structure and cosmology with authentic ancient Greek practice to create a viable Hellenic brand of Our Own Druidism. Erynn Rowan Laurie is the author of Ogam: Weaving Word Wisdom and A Circle of Stones: Journeys and Meditations for Modern Celts, along with many other essays, poems, and articles. She has been a practicing Pagan since 1984 and is a founding figure in the Celtic Reconstructionist Pagan movement. She lives on the Salish Sea among cedars and mist. Join author Erynn Rowan Laurie for a workshop on the early Irish Cauldron of Poesy poem. We will be discussing the poem and its meaning and background, and practicing some breath and meditation techniques based on the concepts expressed in the poem. Melissa is the winner of the 2010 Wellspring Bardic Chair and the Bard of Three Cranes Grove, ADF. 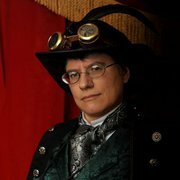 She serves ADF as the Members Advocate, as Archivist of the Bardic Guild and as a DP Mentor. She performs musically at local venues in her hometown of Columbus, OH. She is also working through several study programs, including those of the bardic guild and liturgists guild, and is walking the Initiate Path. Music is a well-documented tool for creating group mind and raising energy, but too few Druids in ADF and beyond know how to use it to it’s fullest potential. In this workshop, we will discuss the brain mechanics (briefly) behind why it works to help us better understand this important ritual device. We will discuss the basic uses of music in ritual, including placement of various pieces, appropriate song choice and theatrical presentation. The bulk of the workshop is centered on actual exercises building on one another from grounding and centering using the “Druid’s hum,” to toning as a means of raising/moving energy for magical workings such as gate opening, healing and charging a magical object and ending with basic trance using vocalizations (and maybe drums!). Ceisiwr Serith is the author of The Pagan Family, Deep Ancestors, and A Book of Pagan Prayer. A pagan for over thirty years he has presented workshops at numerous pagan festivals and delivered papers at Celtic conferences at UCLA, Berkeley, and Harvard. He currently lives along the seacoast of New Hampshire, where he is the Grove Organizer for Nemos Ognios, a protogrove of the druidic organization Ár nDraíocht Féin. Ritual drinks are found in many cultures, but it is in the Indo-European traditions that they really shine -- the mead of inspiration, the ale of sovereignty, nektar, homa, soma -- and not only in ritual, but in myth as well, even to the structure of the cosmos. This presentation will survey the drinks found in the various Indo-European cultures, in both myth and ritual. A presentation on the religious tradition ancestral to those of most of the swath of land from Iceland to India. The concentration will be on cosmology, ritual, and human actions. Other topics may come up as time permits. The office of the sacred king in late prehistoric and early medieval Ireland carried great significance in a religiously cosmological sense both for his people and his kingdom. Jen H. has been an ADF member since 2002. She is a member of the Artisans Guild and Ancient Iberia SIG, volunteers with ADF Publishing, and currently serves as Senior Druid of Sierra Madrone Grove. 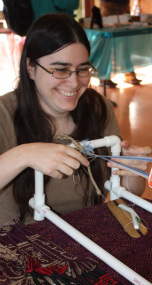 She spends most of her spare time spinning, knitting, weaving, and dreaming up new textile projects. Participants will use scissors and an index card to create a simple loom, and then weave a small piece that could be used as an altar cloth for a travel altar or sewn into a pouch. I want to do this workshop because (1) weaving is awesome and (2) weaving is a common motif in IE myth. I have found that understanding the structure and process of weaving has given me deeper insight into the meanings of myths and lore relating to weaving. I'd love to share some of those stories and insights with others, and of course play around with yarn! This workshop would be appropriate for grown-ups and kids from about 8 years and up. Rev. Sean W Harbaugh and I'm ADF's Northwest Regional Druid. I've been a Pagan for going on 22 years now and a member of ADF since November 2003. I currently also serve ADF as the Chief of the Gael Kin, Deputy Chief of the Council of Senior Druids, Member of the ADF Clergy Council, Member of the ADF Grove Organizing Committee, and a Non-Officer Director on the ADF Mother Grove. Evolution of North American Neopagan Druidry from RDNA to ADF. A presentation on the history and evolution of North American Neopagan Druidry from RDNA, it's off-shoots, and the eventual evolution and foundation of ADF. The presentation will also include an NRDNA Ritual. The purpose of this presentation is to explain the evolution of American Druidry from its beginnings at Carlton College, the prominent figures in early American Druidry, and how this 1963 protest movement laid the foundation for the eventual formation of ADF. I've been a practicing pagan for roughly 15 years and was thrilled when, having moved to Idaho from Scotland, I was given the opportunity to join and take part in Ár nDraíocht Féin. I hope to eventually go through the clergy program but for now I'm happily working on my Dedicant Path work and a podcast documenting that journey. I've been doing simple 'Ceilidh' dancing since secondary school and have been formally doing Scottish Country Dancing with The Thistle and Ghillies Scottish Country Dancers for 3 years. Scottish country dancing, performed to Jigs, Reels and Strathspeys is a great physical and mental workout and a valuable way to build community ties and connect to Scottish culture as a while. I plan to teach the basic steps, a couple of very simple but fun Ceilidh dances and one or two slightly harder Scottish Country Dances for folk to enjoy as part of a wonderful weekend. There are branches of The Royal Scottish Country Dance Society ALL over the U.S. and Canada and hopefully some of you will enjoy it enough to contact a local branch and keep learning! Jenni lives and teaches junior high school language arts and computer applications in Tucson, Arizona. She has been a very active member of ADF since 1995, having served as Non-Officer Director and ADF Preceptor, member and officer of the ADF Bardic, Liturgist, and Scholars Guilds and Clergy Council, and member and friend of several groves and protogroves across the country. The past year has been a bit of a hiatus for Jenni as she pursued a National Board Certification in English language arts, but now that her work on that project is completed and the waiting for results begun, we hope her muse returns and the poetry begins to flow again. This workshop will begin with a survey of uses of repetition in poetry (sound and syntax) and examine some examples of poetic forms of varying degree of complexity. Then participants will spend several moments in deep breathing and meditative contemplation about the entity for whom they will create a prayer/invocation. Participants will then be invited to share their ideas with others and/or work together individually or in small groups on their prayers.